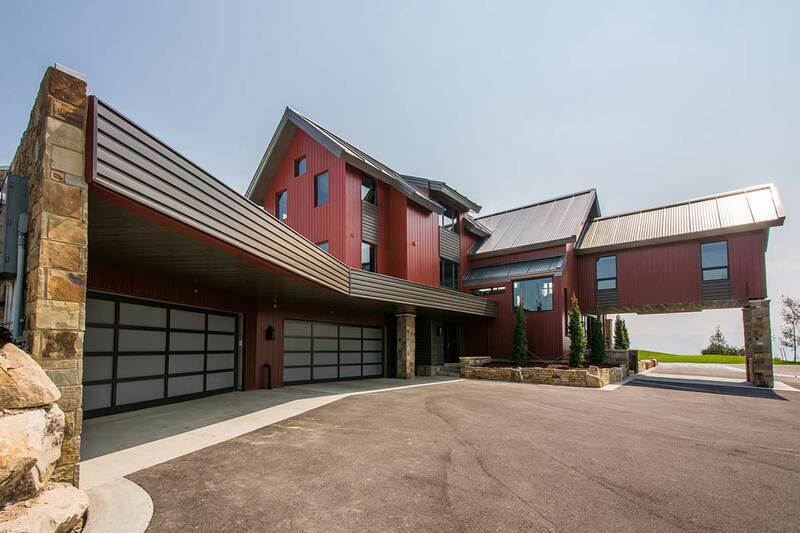 This fully customized all steel home creates a striking combination of Modern Prefab and EcoChic Design. 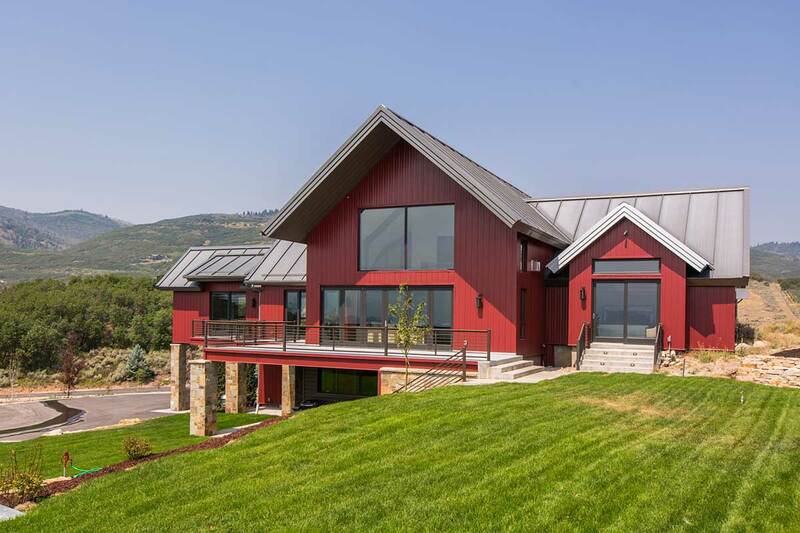 This home was designed by EcoSteel for a remote location on a Private Ranch in Park City, Utah. Off-Grid operation with Solar Power, 10,000 Gallon Water Storage, Grey Water tanks for irrigation, and many security features we are unable to mention due to client request for privacy. This property has limited site access and strict rules against disturbing surrounding vegetation. The steep sloping site required a 3D Model to maximize the height of roof line with code restrictions. Clear span rooms and walls of glass are balanced with ultra efficient Pre-Insulated Steel Roof and Wall Panels. The SIP style panels have been proven in the commercial industry for over five decades of use. The Bolted Steel Frame System capitalizes on the expansive views from this 14 acre Goshawk Ranch lot. 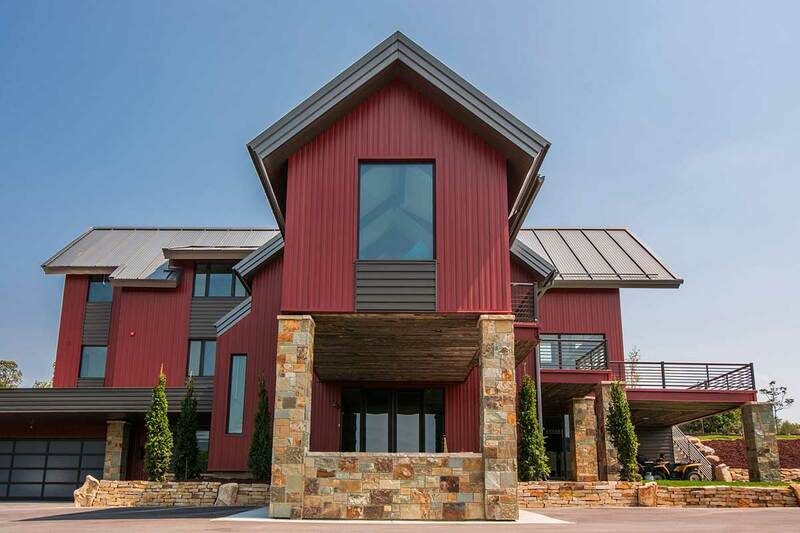 With three stories, floor-to-ceiling windows and vaulted ceilings, this home bathes you in light and mountain vistas. The open floor plan creates spacious gathering areas and great rooms, and the two kitchens, two master suites, numerous outdoor spaces, and plentiful parking make this house a perfect entertainment venue. In each room of this all steel home, trusses and beams have been left exposed, creating an intriguing industrial look. Wood and stone floors, custom cabinets, granite countertops, and glass light fixtures accent the interior's clean style. Both Master Suites boast luxurious tubs with views as well as sitting areas with fireplaces. This home is wired to be a "smart home" and was finished to a high standard of energy efficiency. Resting in the sage brush of the hillsides near Deer Valley, Utah the home is not easily accessible by the local fire department. With summer heat creating dangers of wildfires the all steel roof and wall panels are Prefabricated with Fire Resistant materials to protect against Flame Spread. Our panels are UL Listed and come with a manufacturers 20yr warranty.